Training in safe food handling is essential for any food business and anyone who undertakes or supervises food handling operations. Training can help to ensure you meet your legal obligations under the Food Safety Standards and serve food that is free of hygiene hazards and safe for your customers to consume. On completion of the course, you will receive a Nationally Recognised Statement of Attainment, accepted in all food handling hospitality and retail industries. This Statement of Attainment will give you a credit towards completion of 46 qualifications such as a Diploma of Hospitality, a Certificate IV in Tourism and a Certificate II in Retail Fast Food. Refer to our FAQs for a full list of the qualifications. This course is not nationally recognised. You should complete this course if you require an introduction to food safety in the hospitality and retail industries but do not require a nationally recognised Statement of Attainment for SITXFSA001 – Use hygienic practices for food safety. 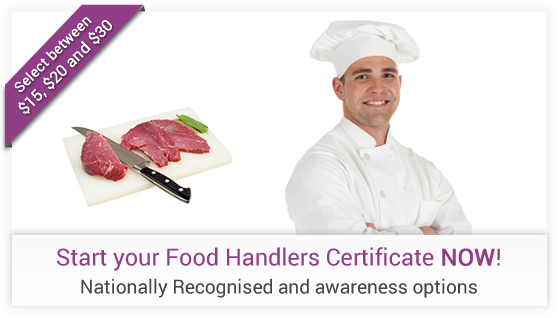 This basic awareness training course uses the course content from our nationally recognised “Food Handling Certificate Course” (SITXFSA001 – Use hygienic practices for food safety) but with basic quiz-based assessment only. On completion of this course, you will receive a Certificate of Completion only – not a Statement of Attainment. This course is not nationally recognised. You should complete this course if you only require a very general introduction to food safety in the hospitality and retail industries, and do not need to understand the details of how to control and eliminate food hazards in the workplace. On completion of the course, you will receive a Certificate of Completion.